Back to School this week! Dear Parishioners: It’s back to school this week! Summer is over for our students and teachers as Wednesday is the first day of school. 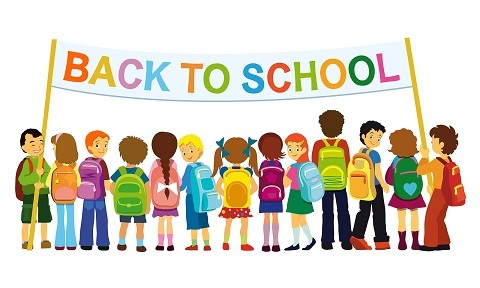 The summer vacation seemed to fly by but I am sure our school children and perhaps even their parents are ready for the return to the classroom! When I was a school kid summer didn’t end until Labor Day and school didn’t begin until after the holiday. However, most school districts in our state including East Greenwich now begin school the week before Labor Day. So as school begins I ask for your prayers for our students, teachers and staff as they begin another academic year of learning. Our parish school follows the East Greenwich Schools Calendar so we begin this Wednesday as well. Of course our dedicated teachers begin this Monday in preparation of the school year. We are most grateful for their service to our parish school and wish them the best this year. We also wish our new OLM Principal Scott Fuller all the best as he begins his first year of leadership of our great school. We will officially mark the beginning of school with a Mass of the Holy Spirit on Friday, September 5th at 9:00AM. We will call forth the Holy Spirit to guide and direct our faculty and students this year and help them grow in faith, hope, charity and wisdom. Mr. Fuller will be officially installed as our new Principal at this Mass. We invite you to join us for this celebration for our parish community. The OLM Maintenance Staff under the leadership of Mr. Paul Anderson have been working especially hard these last few weeks finishing up some of the renovations of the school. This includes installing the new security system for the school, refurbishing the main corridor and front hallway with new paint, new flooring and a new ceiling tiles as well general maintenance and painting of classrooms. Also the crew from RISE, a part of the National Grid that provides free energy efficiency services, have been installing all new lighting in the school classrooms and corridors. This new lighting will work more efficiently and will likely save on our electricity costs for the school. The lighting and work of installation are free of charge. We’ve also are presently looking into replacing the boilers for the Church and Rectory. They currently use heating oil and our oil bills during the winter months are very high as you can image. Both boilers are old and not as efficient as they should be and we hope to replace them with natural gas boilers. The cost of natural gas is much less than oil and can provide great savings for our parish. I wish to offer my deep thanks and gratitude to the many parishioners who were so generous in our Back-Pack Drive. On Monday we delivered over 100 back-packs full of school supplies to St. Patrick’s Parish in Providence. Fr. James Ruggeri and his parishioners were overjoyed at the response to their call for help. We also gave nearly fifty back-packs filled with school supplies to some families in need here in East Greenwich. Your tremendous witness to charity is deeply appreciated and in the name of the needy, I offer my thanks. Now that he has settled in after a year here, Fr. Connors is serving as the Chair of our Annual OLM Parish Picnic. On Sunday, September 21st it kickoffs our celebration for our Patronal Feast of Our Lady of Mercy on September 24th. We hope to have yet another year of good food, good fun and good times with parish family and friends. Sign-ups for volunteers to help with this great time is to take place in the coming weeks after Masses. So mark your calendar now for this great event in the life our parish and please pray for good weather! Pope Francis was in South Korea last week where he beatified 124 martyrs at a Mass for Korean Youth. In his homily he said: “The martyrs challenge us to think about what, if anything, we ourselves would be willing to die for.“ A most challenging question for us who worship so freely and without fear in this time of violent and murderous persecution of many of our Christian brothers and sisters. Indeed, what would we die for?